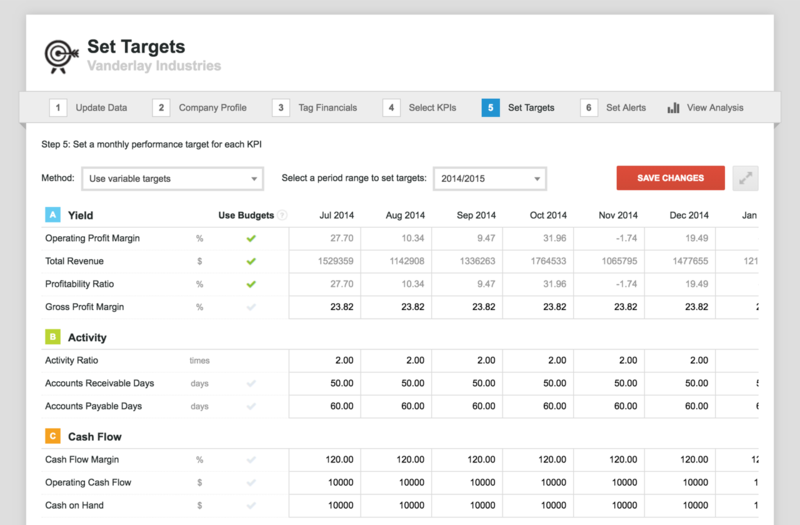 In 'Step 5: Targets', you can set targets for each KPI that has been selected in 'Step 4'. Targets can be applied on fixed or variable bases. In a fixed basis, the same fixed target will be applied each month for a KPI. Fathom will automatically calculate the target for each quarter (or QTD period) and year (or YTD period) based on the KPIs aggregation type. Alternatively, you can vary a KPI's target for each month. To do this you will need to select the method 'use variable targets' at the top of this screen. Variable targets can be used to account for seasonality or growth in the business. The unit of measure (%, $, days, etc.) for a target is defined by the KPI that you are applying it to. 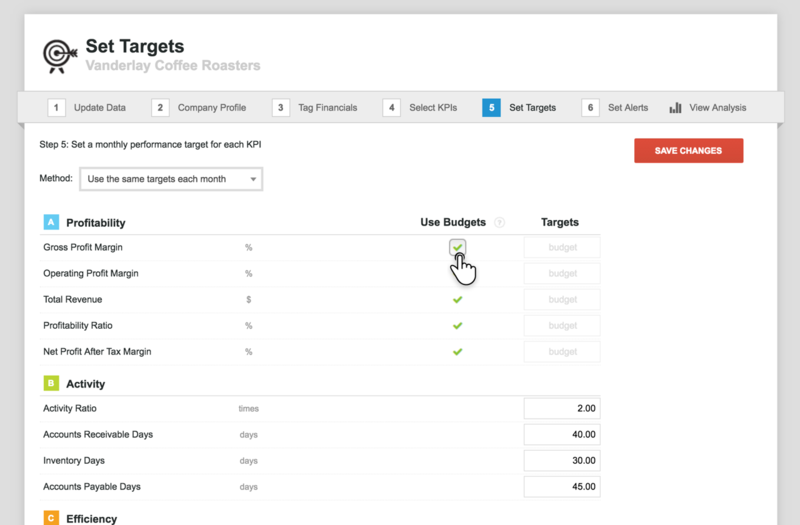 If you have imported a budget, then you can use this budget to quickly set targets for financial KPIs -- simply select the 'use budgets' checkbox. Note: The 'use budgets' checkbox is only available when the KPI result can be calculated entirely from the budget data. For example, if your budget data only includes the profit and loss / income statement, then it is not possible to use this budget data to calculate KPIs which are dependent on balance sheet values. When you are finished setting targets, proceed to 'Step 6'.